This popular crucifix depicts the loving Christ bending toward the troubled world extending His offer of the Gift of Peace, symbolized by the spread winged dove. It expresses perfectly the gospel message of Jesus, “Peace I leave you. My Peace I give you.” (John 14:27). 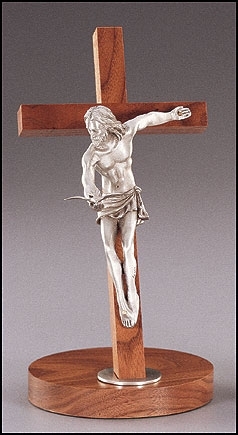 Fine pewter figure is 5-3/4” high on genuine walnut cross with 5” diameter removable base.